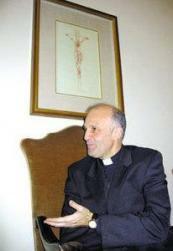 Gozitan Mgr Alfred Xuereb, 54, has been asked to serve as personal secretary to Pope Francis, informed sources said. The appointment has been reported on international media but has not been officially confirmed by the Vatican. To date, Mgr Xuereb was assistant secretary to Pope Benedict. He accompanied the Pope Emeritus to Castel Galdolfo when he retired. Mgr Xuereb also served with Pope John Paul II for two years, taking care of his audiences - be they heads of state or village altar boys - and reading the Holy Father's speeches when he became unable to complete the task himself. The Vatican said today that Pope Francis has provisionally retained all heads and members of the Dicasteries of the Roman Curia, as well as their secretaries, and also the president of the Pontifical Commission for Vatican City State. "The Holy Father wishes to reserve time for reflection, prayer, and dialogue before any final appointment or confirmation is made," the Vatican said.